Allan Rodel, general manager of the Gahcho Kué mine (left), and Wally Schumann, Minister of Industry, Tourism, and Investment for the Government of the Northwest Territories (right). De Beers Canada’s economic and environmental contributions earned it honours at the Mining and Exploration (MAX) Awards Gala on November 22. The event marked the end of the 46th annual Yellowknife Geoscience Forum. De Beers was recognized directly with the 2018 Northwest Territories (NWT) MAX Economic Leadership Award, thanks to its gross value add (GVA) of $2.1 billion to the Northwest Territories economy. That number is expected to increase by another $5.3 billion over the course of the Gahcho Kué mine’s life. To date, De Beers has contributed more than $7 billion to Canada’s economy. The company has already taken some steps toward sustainability. The Gahcho Kué mine comprises one part of Ni Hadi Xa, an environmental monitoring agency that also includes five Northwest Territories Indigenous communities. The agency was recognized at the gala with a second accolade: the Environmental & Social Responsibility Award. 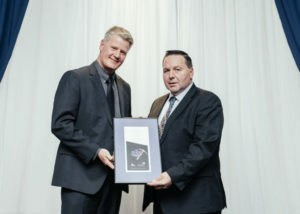 “Through their contributions and commitment to sustainable, responsible development, the people and businesses we will honour this evening have made lasting contributions to our territory,” said Wally Schumann, the Government of the Northwest Territories’ Minister of Industry, Tourism, and Investment.